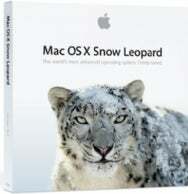 It’s Snow Leopard launch plus seven days, so what’s the final word? As with most things, it depends on who you ask, so the Macalope cooks up a batch of anecdote soup. But hold the Flash, because, waiter, there’s a bug in mine. (Don’t talk so loud, everyone will want one!) And MMS is coming, but is it too late to save this relationship? So, other than that, how was the Snow Leopard launch, Mrs. Lincoln? In an odd role reversal, you don’t dare say “smooth” around the Macalope’s good pal Merlin Mann. Merlin could have played all the Kenny G he wanted and his upgrade would still have been anything but smooth. But anecdotes, like celebrity deaths, come in threes and, for his money, the horny one had an utterly smooth upgrade. He played it safe, backing up and upgrading only one machine. A little while later he was up and running without a hitch and trying like the dickens to figure out what was different. The problem with these upgrades is there’s no real way to gauge how they went except by collecting anecdotes. There’s no international body that invites Jimmy Carter in to validate the results. To the Macalope’s eye, it doesn’t seem any worse than any other upgrade, but that’s no consolation if your stuff doesn’t work. Meanwhile, have you heard about Snow Leopard Flash problem? Yes, apparently there is a dreadful flaw in regards to Flash, in that Snow Leopard still installs it. Ha-ha! That’s a joke. (It is?) No, the problem is that Apple shipped an older version of Flash with some bugs in it. Now, some will tell you these things take time and you don’t yank out a valuable Web browser asset like Flash at the last minute without doing weeks of regression testing. By which he means lemonade without Flash in it. Because it’s better that way. Looks like the enormous feet of AT&T are precariously close to the fire these days, as people are starting to wonder exactly why we’re sending them money every month. Here, at least, the anecdotal evidence really adds up to a great steaming pile of failure to deliver. AT&T iPhone subscribers, both new customers and upgrades, take two-year contracts with data packages. As a result, robust iPhone demand drives strong recurring revenues and substantial long-term value. We help AT&T maintain that sweet 40 percent wireless margin and we get MMS long after every other class of cell phone user in existence. And tethering? What’s that? It’s a nice business if you can get it. And, as long as we’re finding blame, iPhone owners aren’t blameless either! We knew AT&T was going to be a weak link from day one! And we still bought the phone and signed the contract! We lined up for the privilege! So, then, it’s spankings all the way around. Oh, but AT&T? You go twice.